The 2st Semi-final was completed today and after the announcement of the results, today’s 10 qualifiers gave the press conference where the draw took place for the half that everyone would appear at Saturday’s Final. Serbia: They were happy that they were announced first and did not have to wait until the end to be announced. 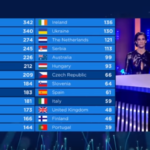 Moldova: P. Krikorovafter thanking Europe for their votes, he outlined that their team is a multinational one (Moldova,Russia,Ukraine,Greece) and he expressed his sadness Russia did not qualify. 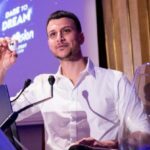 Hungary: after being asked if they are ready to win,they said that they do not if they can win but for sure they will try to and give their best to achieve it. Ukraine: melovin stated after a relevant question that he got already congratulations from Verka who phoned him before the show to advise him to put the people’s hearts on fire as he sings. Sweden: Benjamin thanked everyone for supporting him and after being questioned if the country can achieve its 7th victory, the Head of Delegation answered that Benjamin is fantastic but it is tough final with lots of great songs, so we all have to wait and see. Australia: Jessica was asked to compare her stage perfomance back in Copenhagen to the one in today’s semi-final.She responded that they are two different experiences and she is blessed to have a very productive team getting better each day.She outlined the electricity all around the love feeling coming from the crowd and that is what her song is all about ans she wants through her song to turn this love back. Norway: Commenting on how lot of ex soviet countries like Belarus,Azerbaijan,Russia are out of the final will affect votes coming from these countries,he stated that Eurovision Song Contest is a very strong show and you can never know how the votes turn out. Denmark: After being asked if Denmark,after its last win in a Scandinavian country (Sweden) can repat the same in a Southern country,he stated that the final is a tough one but why not? Slovenia: Being reminded that her 2nd interview conference she said that she did not like her song,she was asjed if she chabged her mind after Europe voted for her, she responded that she just said that because she wrote the song only in ten minutes and sent it for the National selection,she never thought it would be appreciated so much as a good song. The Netherlands: Waylon stated how the Eurovision stage gets so many cultures on it and genres of mucis as well.The composer of his song comes from America,his country,while his dancer from Congo,so all this diversity is amazing in the contest. 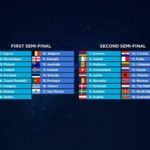 The exact running order will be announced by the organizers in cooperation with the EBU to make the show more interesting.Noting that the Big-5 countries made a draw on Sunday 6 May. It has already been decided via draw that Portugal will perform as number 8 in the Grand Final. The Grand Final will takem place on Saturday,May 12th at 21:00 CET.